It’s time for another edition of my Forex Trading Guide! This time, let’s zoom in on the upcoming Australian jobs release, why it’s important, what’s expected, and how it could affect the Aussie. The Australian jobs report has two main components: the employment change figure and the unemployment rate. Since the former indicates the change in the number of employed people in the previous month, it is considered a gauge of job creation. Meanwhile, the latter measures the percentage of the work force that is employed or actively seeking employment during the reporting period. As discussed in the School of Pipsology lesson on fundamental analysis, employment is an important economic aspect because it serves as a leading indicator of consumer spending. A stable jobs market inspires financial confidence, which then encourages consumers to spend more instead of holding tight to their hard-earned cash. In turn, stronger consumer spending then spurs increased business production and eventually overall economic growth. Unfortunately for the Australian economy, the previous jobs release was much weaker than expected, as it showed a 0.3K drop in hiring for July. This brought the unemployment rate up from 6.0% to 6.4%, leading to speculations of a labor market meltdown for the Land Down Under. A closer look at the underlying figures, however, revealed that a significant improvement in the participation rate was mostly accountable for the jobless rate jump. Apart from that, some market analysts have remarked that changes in the labor survey method may have also been one of the reasons for the skewed results. Reviewing AUD/USD’s reaction to the event suggests that traders may have focused purely on the headline figures. After a bit of consolidation prior to the actual release, AUD/USD tumbled by close to 50 pips when the employment figures came in the red then followed through with more losses at the start of the next trading session. For the month of August, hiring is expected to have rebounded by 15.2K, which might be enough to bring the jobless rate a notch lower to 6.3%. 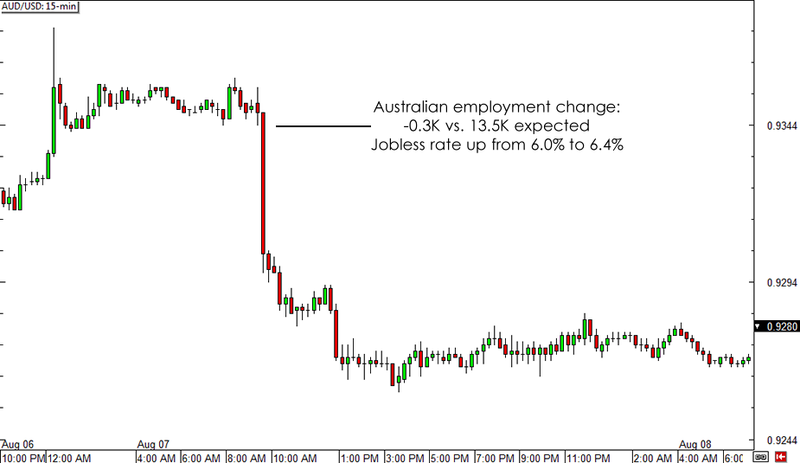 Based on the reaction to the July report, another round of weaker than expected jobs figures might lead to roughly 100 pips in losses for AUD/USD hours after the release. On the other hand, a strong recovery in Australia’s jobs market might lead to an AUD/USD bounce during the Asian trading session. Price tends to continue in the same direction as the reaction candle until the start of the London trading session, before consolidating for the rest of the day. What’s your game plan for the Australian jobs release this week? Share your thoughts in our comment box or vote in our poll below!